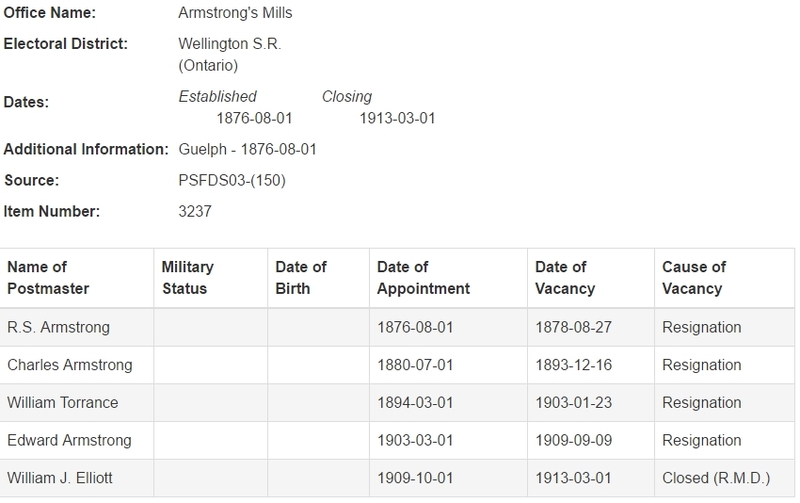 Armstrong Mills (near Eramosa) - Historical Post OfficeRecord Owner? Log in. Armstrong Mills was a small mill town and hamlet named for the Armstrong family who first arrived in the area in 1822.The Armstrong family was active in township and local affairs and by 1845, had established the Speedside Congregational Church. following the opening of a post office in 1876. The mill was used until 1950 however the community experienced little growth following its initial success. In the 1960s the then derelict mill was purchased by the acclaimed realist painter, the late Ken Danby. Mr. Danby spent many years restoring the mill to its former grandeur. In later years it was featured as a backdrop in a number of his paintings. Following his death in 2007, the estate which included the miller's stone house was put up for sale. In addition to the restored mill, Armstrong Mills contains a few other early vestiges including the schoolhouse, now a private home and attractive little church built by the Armstrongs, now known as the Speedside United Church. Have something to say about Armstrong Mills (near Eramosa) - Historical Post Office?